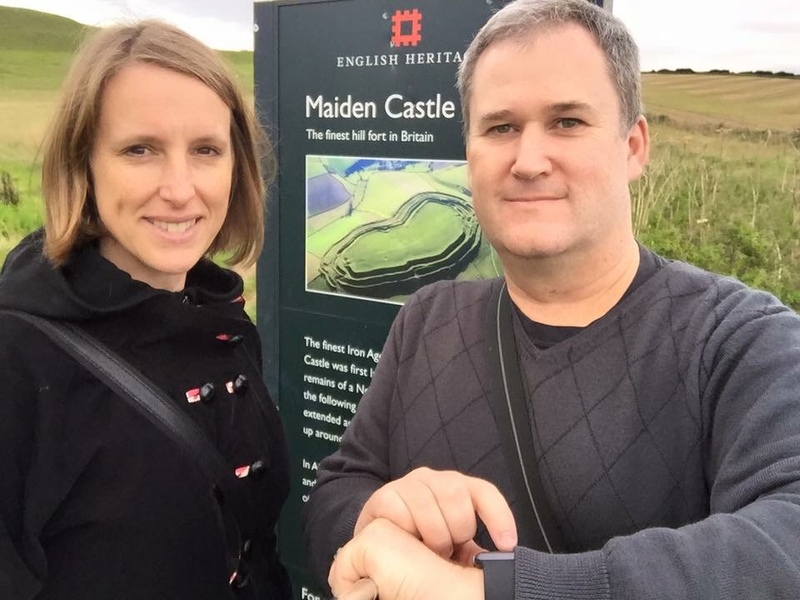 We hit the road early this morning, and headed straight for … you guessed it, a castle! 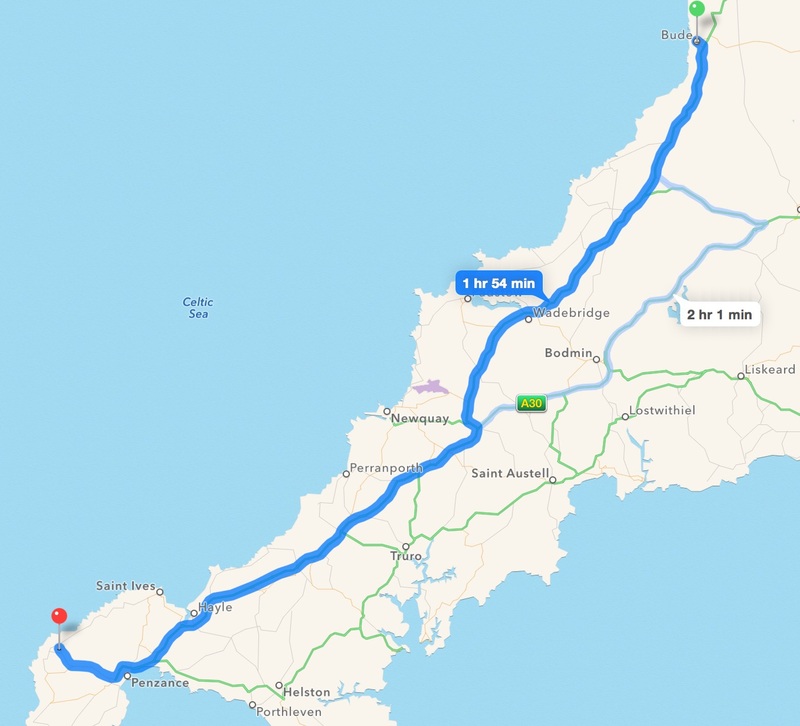 Bude to Land End, with a few stops along the way. 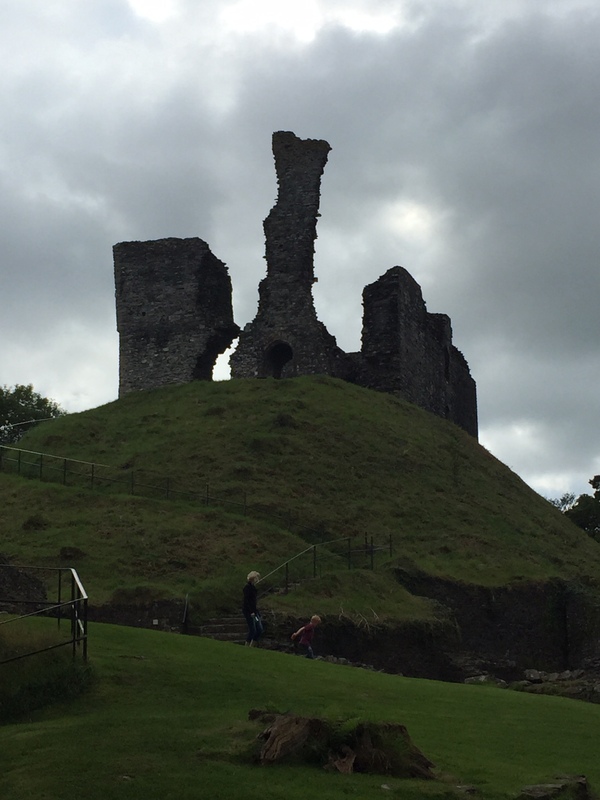 Launceston Castle is another motte and bailey castle, much larger than Okehampton. It was also built shortly after the Norman conquest. It was a wealthy and powerful castle, being the administrative headquarters for the Earl of Cornwall. You can definitely see the difference between Okahampton and Launceston – Launceston is huge! We happened to arrive in Launceston village just as they were starting their annual 10km fun run, so that made life a bit interesting. A bagpiper sent the runners on their way. We watched them leave from the town square, and then wandered down to the castle (aka the finishing line), and were just leaving the castle as the first runners came in – accompanied by the pipes. It made the whole visit a little bit interesting. 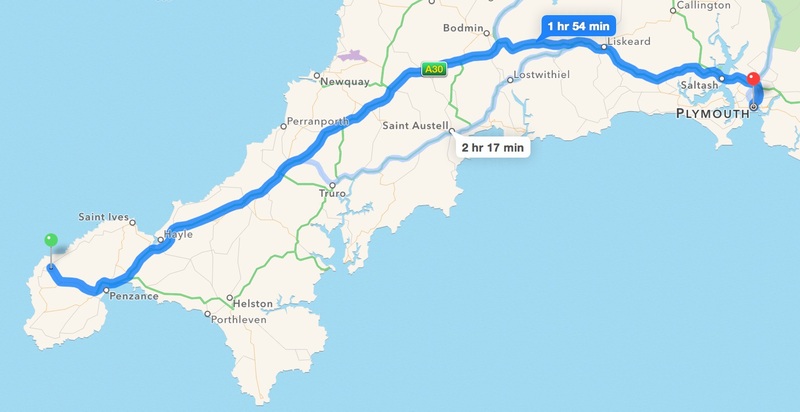 The next stop was a prime destination for me – Tintagel Castle. I’ve dreamed of going to this place since I was a small child – I read a lot of books about castles and this was my favourite. And it was everything I imagined. Tintagel the village is cute and touristy, the castle complex is huge and spectacular. The main castle is on an island just off the end of a peninsula, with a bridge connecting the two. There has been buildings on the site since Roman times, but the castle that’s there now was build in the 1200s. 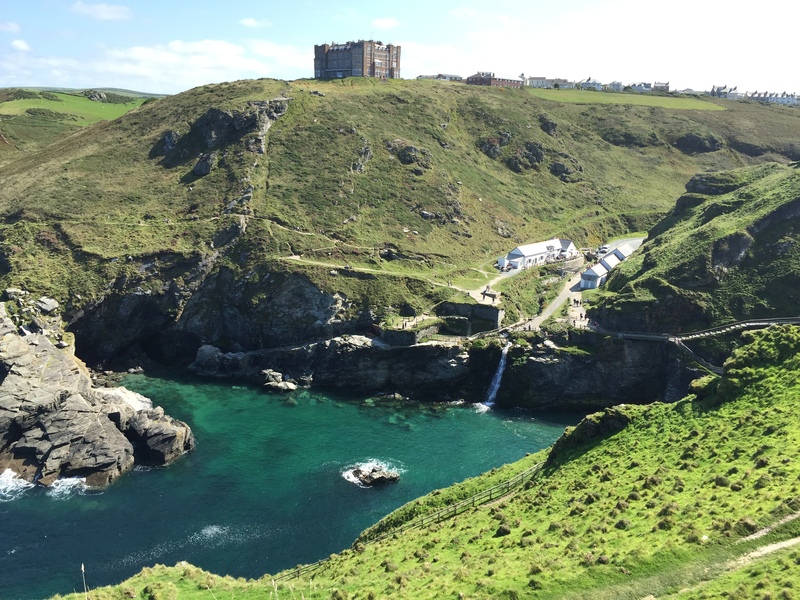 Tintagel is most famous for being the place where King Arthur and the Knights of the Round Table hung out – though there is no evidence that this is actually true facts. View from the island to the headland – you can see the impressive Camelot Castle Hotel in the distance. 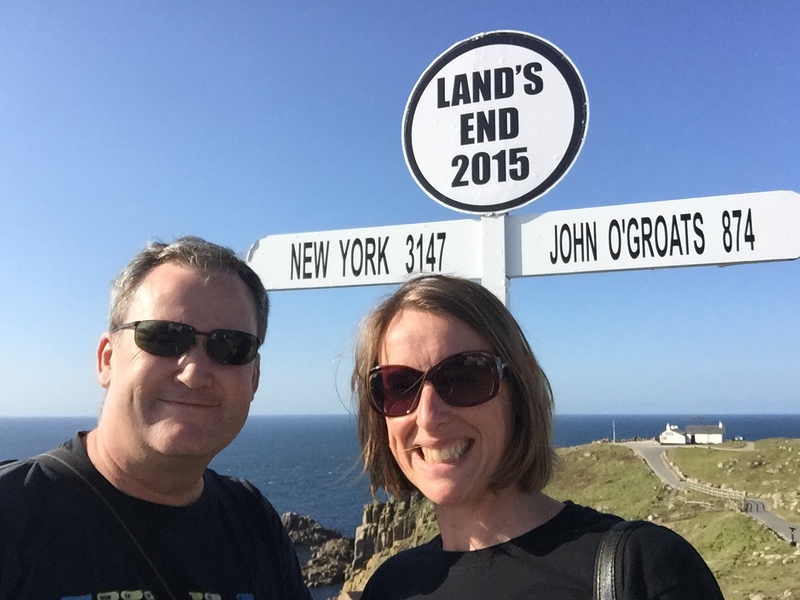 We were hoping to be able to get to a couple more castles before heading for Plymouth (a barren wasteland, history-wise according to locals), but we were running out of time, so opted for Lands End as our final stop for the day. It was a lovely spot to have a coffee and a sit down. The end of the land of England. We finally arrived in Plymouth about 7pm, weary and hungry. Our grand plans to go out for a nice dinner somewhere lasted as long as elevator ride to the lobby….we ate our meal at the hotel restaurant and retired early. I managed to sleep until about 3.30am then I was up for the day, so did some research on where we were going for the day. The first stop for the day was Maiden Castle in Dorchester – not really a castle at all, but a massive Iron-Age hill fort. We went up and around it for a nice morning walk. The sun was shining and the sheep were chatty. Delightful! From there we went on to Corfe Castle, which is the name of both the village and the castle. What a beauty! It’s a massive complex, with an inner and outer bailey, and obviously grand in its day. 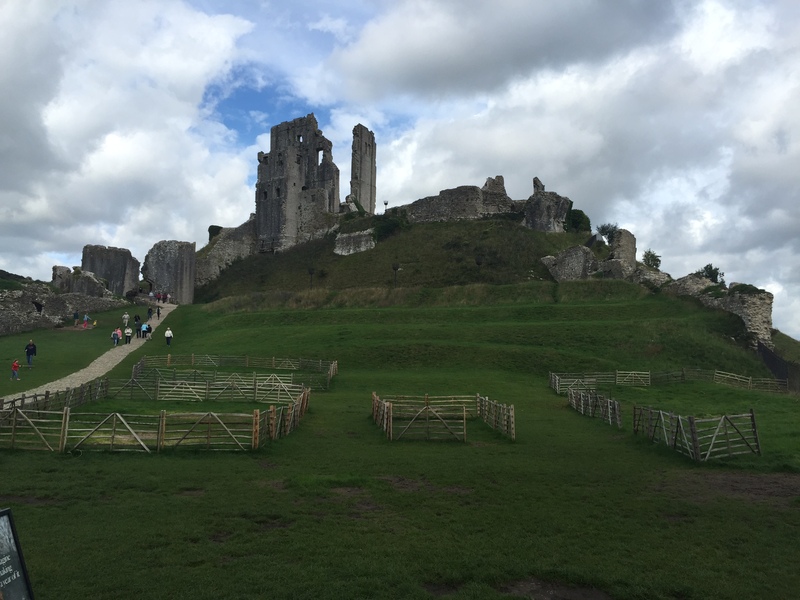 Corfe Castle, built by William the Conquerer and destroyed in 1645 after a long siege during the Civil War. 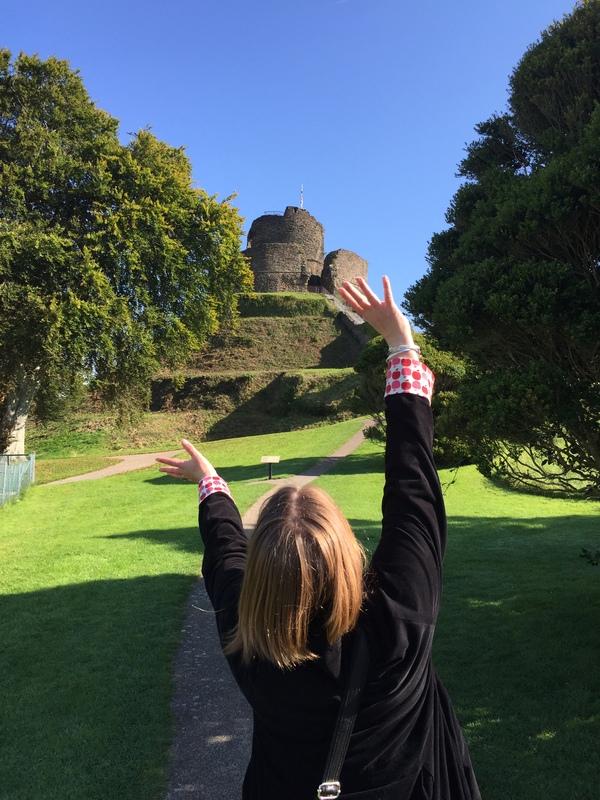 Next stop was Okehampton Castle – a big motte and bailey castle that was built immediately after William the Conquerer arrived in Britain. The ‘motte’ refers to the large mound that the main fortification (keep) sits on, and the ‘bailey’ is the courtyard that surrounds it, containing a main hall, kitchens, chapel, stables, workshops, etc. This one is in a lovely out-of-the way spot that was clearly a good place to defend the area – you can see for miles from the top of the hill. The walls of the hall at Okehampton are on a serious lean, causing Safety Dad some concern. We were planning to go to Penzance from here, but we had been delayed by Saturday traffic all day, so decided to skooch across to Bude where we were staying for the night, and call it a day. Bude is a lovely seaside town. We took a stroll in the evening, no castles to see here. 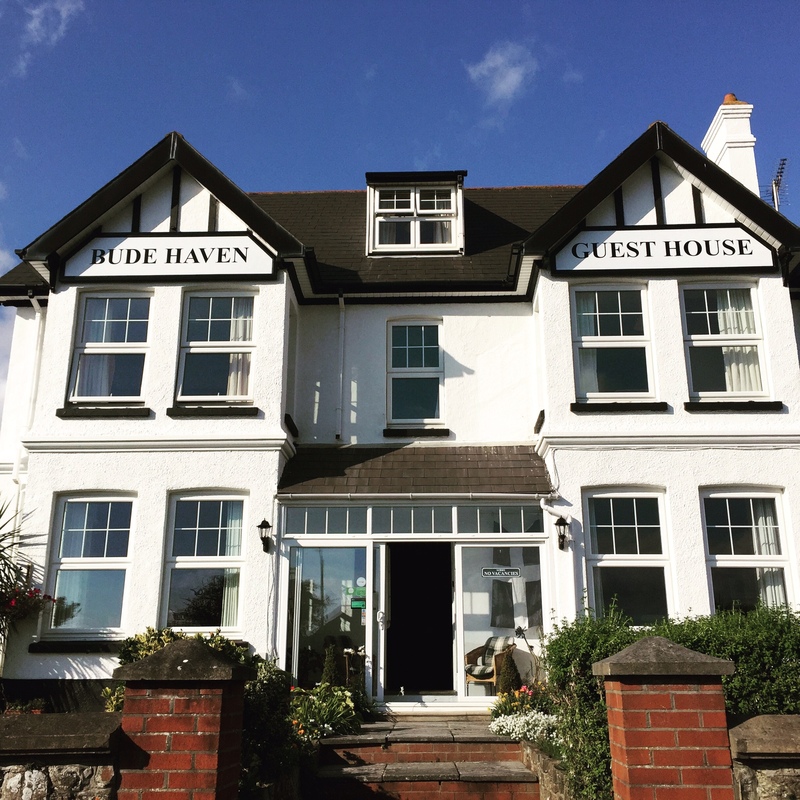 Bude Guest House was rickety but comfy, and had a great breakfast!